Do you have a gun collection that you’re proud of? If yes, then you should invest in the best gunsmith screwdriver set ASAP! Many people think that using a screwdriver is easy-peasy. But it isn’t as easy as fitting the screwdriver into the screw and twisting, especially with precision instruments like guns. No wonder the repair racks and used gun racks in gunsmith shops are filled with countless damaged screws! Even the wrong twist can result in their heads becoming chipped and mangled – and useless. But with the right screwdriver and gunsmith screwdriver bits, even a beginner with basic skills will be less likely to damage the smallest parts on a gun. Here are my gunsmith screwdriver set reviews that many gun owners have found useful in making an informed decision. The bits are made from S2 tool steel with a hardness of 56-58 Rockwell C so these are likely to withstand hundreds of use. These will fit virtually any screw on more than a hundred classic and contemporary firearms. The selection of Torx, Allen and Phillips bits will cover most, if not all, bases, rings, and recoil pads. The set is designed for professional use, thanks to the addition of the 15 specialty bits suitable for the installation of scope bases. There are two handles that come with the set, both of which are made from durable and comfortable overmolded plastic. The regular size handle works well for most jobs while the shorter, slimmer handle works best for detailed jobs. The hollow-ground bits are the best for gun screws since these are the perfect fit. The magnets on the handles make it fast and easy to use the bits yet these are weak enough not to attract other metallic objects. Getting good value for your money is possible since everything in the set has its specific uses. Many users even say that a few of them may not even be familiar with amateurs but can still be used down the road. All the bits and tools are interchangeable so there are more than 200 tool combos that can be made from the set. These are made from strong and sturdy steel, too, so longevity with proper use is guaranteed. These are also treated with a black oxide finish for added rust protection. The risk of transferring rust from the bits to the gun screws can then be reduced although regularly bluing the gun still pays off. 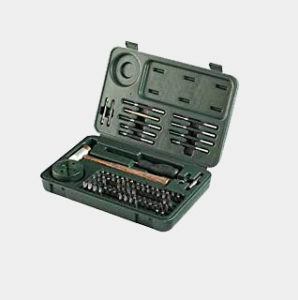 The bits cover most needs of amateur gunsmiths but the set itself may be a good addition to your own tool collection. The 12 slotted bits, for example, range from .125” x .030” to .375″ x .050″ while the 7 Star bits range from S6 to S30; the latter fit Torx screws. The smaller bits will not damage the delicate screws on guns, too. When you apply excessive torque, these bits usually break so that the screws will not break. The Midget Ratchet is a better tool for leveraging than a large screwdriver. But since these provide greater torque than needed for small screws, you should use an even and gentle pressure. 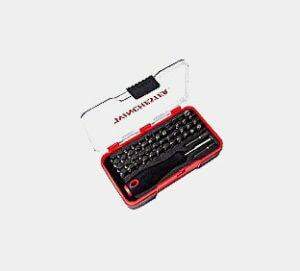 With 49 bits, you may find the Winchester gunsmith screwdriver set as the most useful set of tools in your shop. These bits fit many types of vintage and modern guns, a must for gun collectors. The tips are the hollow ground type, too. These are considered as the best for gun screws since these will not alter the heads when proper torque is applied. The handle’s tip is also magnetic for easy and fast picking up of the bits and screws. It also seems to be durable enough to withstand abuse. The bits appear to be made from durable steel, as is the case for the handle. These also seem to have been treated to an anti-rust treatment for longevity. There’s also a socket adapter for increased versatility of the tool set. The 49 bits plus the handle and socket adapter can be organized in the plastic storage case. You can carry it from your shop to another area since the entire set is relatively light. 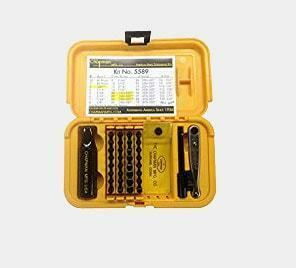 If you’re a DIY gunsmithing enthusiast, then you may find the Winchester set a useful addition to your growing collection of tool sets. You also have the assurance that the set itself is of good quality, thanks to the reliable Winchester brand. 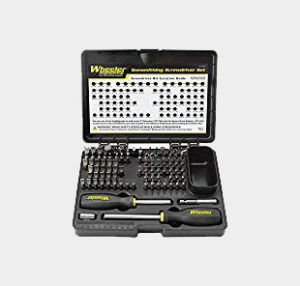 The Wheeler 43-piece gunsmithing screwdriver set is the smaller cousin to the Wheeler 89-Piece Deluxe set. But even with its smaller number of bits, it may still address your needs in a screwdriver set. With its bits, you don’t have to deal with the damaged screws on your guns that other non-gunsmith screwdrivers inflicted on them. These can be used on a wide range of classic and modern firearms, too, from your Colts to your Brownings. The S2 tool steel used on the bits are durable on their own. But these have been hardened to the standard 56-58 Rockwell C for even stronger quality. As with all gunsmithing screwdrivers, these should be used with the proper torque and fit. Even the strongest bits will be ground down without proper use thus my recommendation. The hollow-ground design on the bits features a gentle curve design. This protects the screw’s fit and finish, as well as spreading the torque along all sides of the slot to prevent damaging the tip and screw. No screwdriver kit is complete without a screwdriver. This one has a non-slip, ergonomic and overmolded handle for ease in application of torque. This is more suitable for use on a hunting gun although it may also be used for other types of guns. The set is a quality product of Bushnell, a brand known among gun enthusiasts for its wide range of gun-related accessories. The kit has many of the tools for disassembling and reassembling guns, as well as mounting scopes except for the levels. The bits are durable due to their hardened steel production but these also seem to rust faster than the others. These are obviously interchangeable with the screwdrivers. You will agree that it’s a common feature in all the gunsmith screwdrivers in my list but it’s a welcome feature, nonetheless. The hammer is light so it’s easy to wield in your hand. But it’s only good for knocking already loose pins – it’s good but it isn’t great. The punches selection is also good. There’s only one branch punch and no recessed tip. The base has most of the sizes needed for knocking pins. But the sizes could have been larger in my opinion. The lifetime guarantee that comes with the Grace gunsmith’s screwdriver set is one sign that it may be a good investment for gun owners. 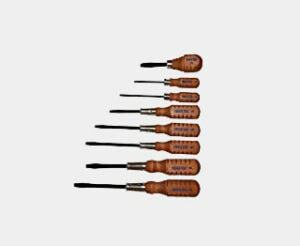 The screwdrivers have wooden handles, a feature that attracts many buyers. You will probably also buy it because of the nostalgic quality, while I think that wooden handles are as durable as plastic ones. You may or may not apply lacquer on the wood handles to bring out the grain. The lacquer, however, makes the handles stronger so I suggest doing it, especially as it’s inexpensive to do so. The Grace screwdrivers are also ergonomically designed for a good grip. These usually have a square shape instead of the usual rounded handles. But the bits are the heart of the set and these seem to be robust enough to withstand years of regular use. There’s also a wide assortment with the kit although you may have to buy a few more tools. The bits should be used with the right torque since these aren’t as sturdy as, say, the Wheeler bits. 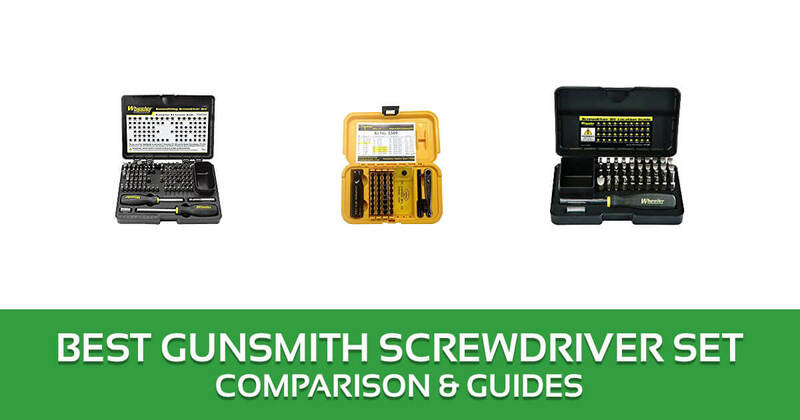 Don’t just choose a gunsmith screwdriver set based on the price alone. You should consider the more important aspects including overall quality, selection of bits and tools, and warranty, among others. First, look at the overall quality of the set. Second, decide about the number of bits that you need in the set. You may want the Wheeler Deluxe set, for example, because of your extensive gun collection or the Wheeler 43-piece set for travel purposes. I suggest making an inventory of the guns in your collection and the types of work you plan on doing to them. You can then make a better choice in the screwdriver set since the bits and tools in it are useful for you. You may also want to consider the lengths of the screwdrivers. The ideal set-up is a set that contains a short-handled and a long-handled screwdrivers so that most types of work can be done. Third, ask about the warranty or guarantee. It’s an assurance of quality in most cases because the manufacturer stands behind its product. You have to consider the universal applicability or interchangeability of the tools, too. You may even look into the aesthetic design of the bits and tools, if it matters to you. 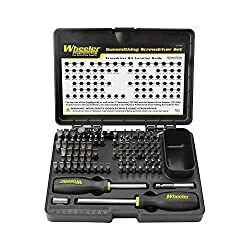 Based on my personal experience, I think that the Wheeler 89-Piece Deluxe Gunsmithing Screwdriver Set is the best gunsmith screwdriver set in the list. The bits and tools are all interchangeable, as well as made with robust use, organized storage, and ease of replacement in mind. I haven’t taken keen interest on my toolbox lately nut I am in possession of bad screwdrivers for my guns and I think I need an upgrade. The past designs I have bought over 3 years down the line have costed me more in replacement costs and I hope buying the Wheeler Professional Gunsmithing Screwdriver Set (43-Piece) in this blog won’t frustrate, thanks to the Multiple sizes for each bit it comes with.